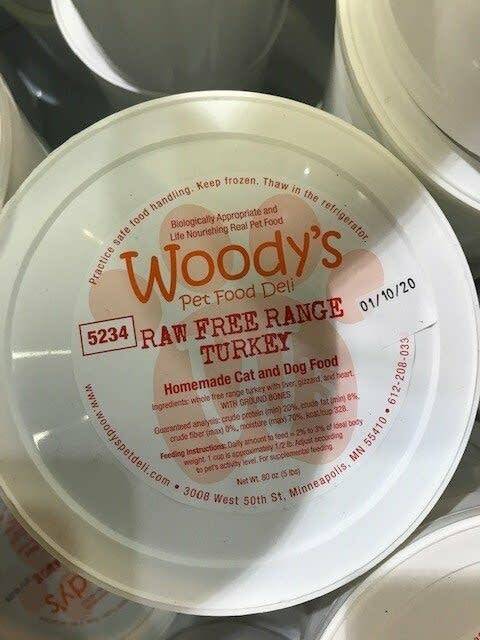 The recalled product was sold in 5-pound plastic containers labeled "Woody's Pet Food Deli Raw Free Range Turkey" and can be identified by the white date sticker on the cover of the pet food container, the state health and agriculture departments said in a statement Monday. No other lots of Woody's Pet Food Deli products are affected by the recall, the agencies said. Consumers with the recalled product at home are being told to throw it out or return it to a Woody's Pet Food Deli for a full refund and not feed the contaminated product to pets, state officials said. Consumers with questions can contact the Woody's Pet Food Deli stores directly or email the company at info@woodyspetdeli.com . Sampling began after the state health department identified a human case of salmonella linked to the pet food as part of the agency's ongoing, multistate investigation of salmonella infections coordinated by the federal Centers for Disease Control and Prevention. The state health department said its interview of the stricken person revealed that Woody's Pet Deli raw ground turkey pet food was regularly fed to a pet in the household. The pet also tested positive for Salmonella, but not the outbreak strain.